Jason and Lenai sat cross-legged on two cushions she had dropped on the floor. They faced in opposite directions, with his knee by her hip, and her knee by his hip. He felt his pulse quicken as she drew out her dagger and laid it across her lap. “Before we begin, know this,” she said, holding his eyes with hers. “What we are about to do is Sho tu Ishta, the Ritual of Clarity. For generations, my people have practiced it in time of need. Ordinarily, a Shanthi would do this alone, although in needful circumstances two may perform it together.” Her gaze sharpened. “It is rarely done with those who do not have Shanthi blood in their veins. He thought about what she’d said. What did she mean by a place where there are no lies? He didn’t think he had anything to hide, but he also knew he wasn’t exactly a saint. Plus, his feelings about the Circle were confused. What if he found out that his ancestor was right? Or what if she misinterpreted his confusion? If she thought he might go back to Bothan, he doubted he’d get a chance to explain himself. “Very well. Raise your hand.” She raised hers to show him, holding her upper arm level with the floor and her forearm and hand pointing toward the ceiling. He imitated her position. Then she opened up her hand. He saw her fingers elongate, the folds of skin under the knuckles opening up to reveal sucker-like structures. Before he could react, she grabbed his hand in hers, wrapping her lengthened fingers about his hand. He expected to feel a slimy or sticky sensation from the suckers, but was surprised when they only felt warm. She dropped a loop of fabric over their clasped hands, letting it fall loosely about their wrists. Then she picked up her dagger and held the blade against her own forearm. “Move your arm against the dagger so that it is held in place,” she said. Gingerly, he did as she asked. Once his arm was against the edge of the blade, she let go of the dagger, and pulled the loop of cloth down firmly on their forearms, causing both of their arms to press against the blade. “Since you do not have Shanthi blood, we must share mine,” she said. Before he could protest, she jerked the dagger out. He winced as the hot bite of the blade opened up his forearm, then gasped at an electric tingle that shot up his arm as her blood mingled with his. He would have pulled away, but her grip and the cloth held his arm solidly in place. As he closed his eyes, she started chanting in her native tongue. He didn’t think he would be able to clear his mind, but as he focused on the strange words, he felt his other thoughts slipping away. Within moments, his entire being rode on the current of words flowing from her lips. He felt as if he was floating up from the floor, buoyed by the rise and fall of her voice. 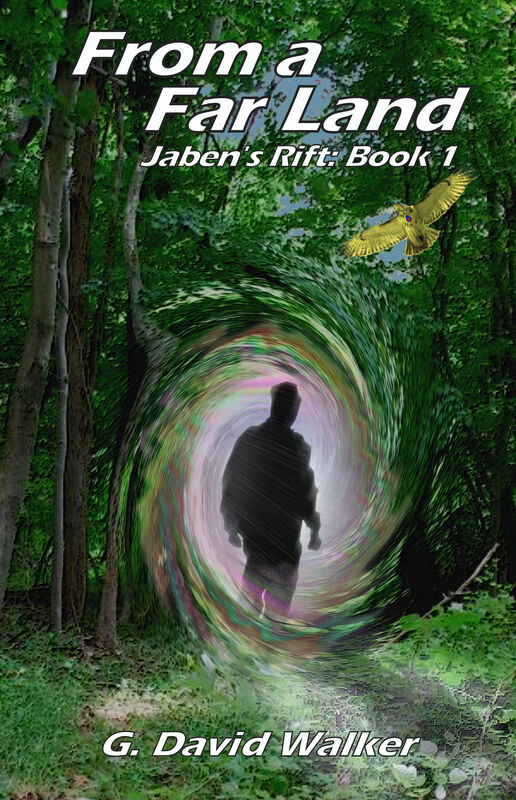 Inside his eyelids, he started seeing swirls of color that reminded him of his arrival. This time, however, he was not afraid. Then her words sucked the soul from his body. Sitting high in a tree outside of Lore’s Haven, the fortunewing raised its head. Jason Bennett and the Shanthi girl were joining in some sort of ritual. Perhaps this was the time it had been waiting for. It lifted from its perch and flew to the top of one of the towers of the keep. Down below, the bird saw one of the humans on the wall glance up and then call to one of the other humans, gesturing toward it. The bird’s name was Crin, and it had never understood why humans acted as they did when they saw him. Crin flapped his wings once and settled his feathers more comfortably. This appeared to agitate the humans even more. Crin ignored them as he turned his attention back to the ritual inside. Jason found himself on an empty plain, the sky overhead filled with colors swirling wildly in a wind he couldn’t feel. Watching the churning sky made him dizzy so he looked away toward the horizon. There was something standing on the plain in the distance. It was the only thing he could see other than the flat surface on which he stood, so he started walking toward it. Then it occurred to him that he was alone. “Lenai?” he called. There was no answer, so he kept walking toward the distant object. As he got closer, he realized that it wasn’t one object, but three. Three mirrors stood in a semi-circle on the empty plain. He kept walking until he stood in the middle of them. The mirror in front of him showed the empty plain behind him, but he was not represented in its reflection. He reached out his hand, thinking perhaps it was a portal rather than a mirror. His fingertips touched a hard, smooth surface. It was a mirror, but one that didn’t acknowledge him. Looking at the one on his left, he saw himself, a malevolent grin on his face. Every so often, his image laughed silently. Suddenly, it lunged at him. He instinctively stepped back, but the image never left the mirror. When it saw him flinch, it started laughing soundlessly again. He turned to the mirror on his right. His image there was serene, looking back at him calmly. It smiled and nodded to him, and then resumed its quiet study of him. This is seriously weird, he thought. He turned back to the center mirror. …and found himself facing Julie Peterson, a girl he’d known in school. She’d been his first kiss, and he’d been hers. It happened at a friend’s party one Saturday night. Now, as if seeing the experience as a passenger, he relived the following Monday. He watched as she came up to him at his locker at school, all smiles and giggles. She told him how glad she was that he was her first kiss, how much she’d always liked him, and how special he had made her feel. He listened for a few minutes, embarrassed at the glances they were getting from students walking past. Then he blew her off, telling her she was nice and all, but he wasn’t interested in having a girlfriend. He saw the hurt in her eyes, just for an instant. Then she shrugged and told him she was okay with that. Without waiting for an answer from him, she turned and walked away, pushing through the students crowding the hallway. Shortly afterwards, her family had moved away. He never saw her again. Then the scene began again, only this time he saw it through Julie’s eyes. He felt her excitement at seeing him in the hallway, felt her relive the kiss in her mind as she approached him. He shared her tingling anticipation of walking hand in hand with him, and going to games and dances with him. For that moment, he was the only boy in the world that mattered, and she could only think about the two of them together. Then he felt the crushing weight of his callous words as they shattered those feelings. He felt her struggle to put on the same careless expression he had worn, trying to pretend it didn’t matter, when it felt like her world was crumbling. As she turned away, he came back to himself, shaken by what he’d learned. I was a jerk. They hadn’t spoken again before she moved away, but he’d told himself she was fine. Her pain had been so intense, and he had never given it a second thought. Without transition, he saw himself arguing with his mother a couple of years later because she wouldn’t let him go to a different party. She was being completely unfair! She acted like he couldn’t take care of himself! What did she know about parties? He heard the angry words that he’d said just before stomping off to his bedroom and slamming the door behind him. Again, the scene replayed, with him reliving it from his mother’s perspective. He felt her concern and worry for him. She’d been to plenty of parties and knew, just because of who was throwing this one, what to expect. He was surprised at the sadness he felt from her. She wanted to let him do the things he wanted, but knew this party wasn’t a good idea. Even if he didn’t understand her reasons, her responsibility as a parent was to do what was best for him, even when it made him angry with her. Then, as with Julie, he felt the hurt his words and actions caused her. But even through her pain, he felt her love for him shining through. Her pain was a price she was willing to pay as long as she knew he was safe. She would love him forever, no matter what he might say or do to her. As the memory faded, he swallowed hard, fighting back tears. Have I always been this selfish? He wanted to apologize, but knew he would never have the chance. Another scene began. No, not again. I can’t do this. His protests were meaningless, as he relived time after time where he had been in conflict with another. Friends, girlfriends, parents, all were presented to him without mercy, showing him what he’d done, and how his actions and words affected others. Eventually, the scenes became more recent. He saw his anger with Reyga on the journey to Lore’s Haven; replayed his initial conversation with the High One. He felt again his fury at the Circle for the death of his father, and his rude behavior toward the High One afterwards. He relived his encounters and conversations with his ancestor, and his experiences with Nyala. In each instance he saw both perspectives. A glaring difference was that in his encounters with the Loremasters, he came to understand that they were dealing with an unknown in him, and the prophecy made them afraid of what he might do. The ritual showed him that the decisions they made were based solely on their duties to those under their protection. He felt Reyga’s distress at having to withhold information from him, and the High One’s discomfort, even though the High One had truly felt he’d had no other choice. He saw that, no matter how he had acted toward them, they had never acted the same way in return. With the exception of Loremaster Chon, he had always been treated with courtesy and respect, even when he didn’t deserve it. And now Chon’s dead. He hoped that was nothing more than an unfortunate coincidence. Then he saw that Bothan was hiding something from him. He realized that his initial encounter with his ancestor, and his final one, were far closer to the truth about the man than anything in between. Even the fact that he had told Jason what the Circle had kept from him was surrounded with ulterior motives and deception. He was shaken to the core. I owe so many apologies. I’ve only ever thought about myself. As the thought appeared, he found himself slumped over on his knees in the middle of the mirrors, his cheeks wet. He looked up at the center mirror…and saw his teary-eyed reflection looking back at him. He looked at the mirror on his left. That Jason was furiously screaming at him without a sound. As he watched, the angry figure slowly grew fainter, until only his own reflection stared back at him. He turned to the mirror on the right. The Jason there grinned at him and nodded, giving him a wink and a thumbs up before also fading away. He looked up and saw that the roiling colors had disappeared, replaced with a cloudless blue sky. “It would appear you have your answers,” Lenai’s voice broke into his thoughts. Instantly, new images flooded his mind. As he struggled to understand the confusing scenes, he realized that these images were from Lenai’s past. He tried to focus on what he was seeing from her memories and what he was feeling in her emotions. He saw memories from her childhood. He felt her pride at being a Shanthi, and her confusion and disgust as her father told her about the rishna kel. He saw her interactions with other races, particularly humans, as she grew older. He felt her anger and resentment at the treatment she received from those who based their opinion of her on nothing more than her race. Then he saw her first meeting with Reyga. She had been young, untrained, and curious about humans, even though her father warned her repeatedly that they were not to be trusted. One night she slipped into one of the larger villages, wanting to see for herself. The village was a confusing jumble of twists and turns. How did humans live like this? She made her way toward music and raucous laughter she heard coming from somewhere ahead. She ended up in a filth-strewn, dead-end alley. She turned to go back the way she had come and found a group of drunken men behind her, having just come out of a rundown tavern. They had backed her up against a wall, intent on having their way with her and then killing her. She tried to climb the wall, but it was slick with grease and slime. She could not get a grip. She pulled her dagger and slashed at the men, but her fear worked against her. Her wild swing missed and one of them grabbed her arm, twisting the dagger loose. She fought them until something struck her across the back of the head, and the world skewed sickeningly. She felt them throw her on top of a crate in the alley, heard their taunts and insults, felt hands tearing at her clothes. She wanted to struggle, but her limbs wouldn’t respond. Through her blurred vision, she saw one of the men leaning over her, leering at her. 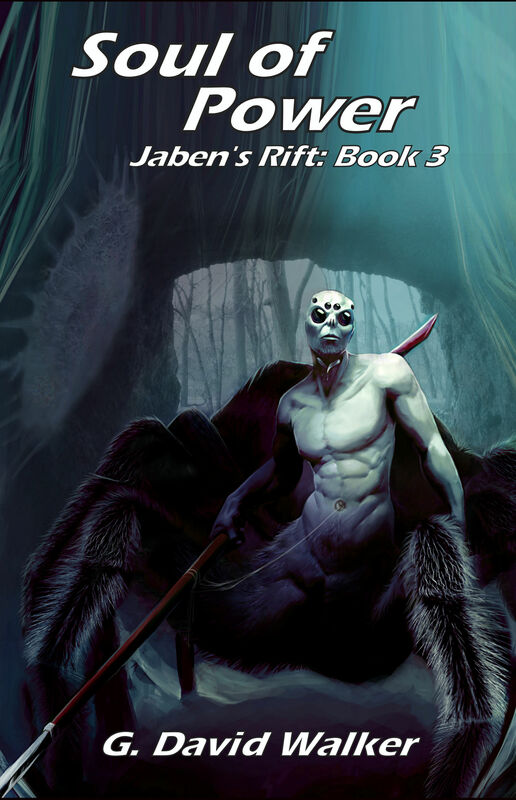 “Yer a pretty one fer shifter scum,” he slurred. She felt his rough hands on her, then a hot flash of light, and he was gone. Blinking hard, she saw a man with white hair and a pale green robe move between her and the drunken throng. He tried to reason with them, but one of the men drew a sword, and managed to land a grazing blow across the newcomer’s arm before another blast threw him against the wall. After that, the rest of the crowd scattered, not willing to be the next on the receiving end of the stranger’s welcome. She tried to raise her head. The effort was too much, and she blacked out. When she came to, she was propped against the wall, a cloak placed over her body. Kneeling beside her was the white-haired stranger. She flinched away, remembering what had happened, but his voice stopped her. She studied him warily, pulling the cloak more tightly around her as she remembered the sound of her clothes ripping. She nodded and struggled to her feet. She touched the back of her pounding head gingerly. Her fingers came back sticky with blood. It was his turn to nod. For the first time, she noticed his staff, and the fist-sized emerald adorning it. She started to protest when he raised a hand to stop her. At that moment, the old Loremaster had become ch’tasa to her, and she had agreed to join the Circle Guard, the first Shanthi ever to do so, to honor what he had done for her. Then the memories changed. Jason felt her shame at her failure to prevent his abduction. He felt her shock and horror, quickly turning to self-loathing, as she learned of Elira’s fate and her own unwilling part in it. He felt her sense of self-worth crumble and fade as she faced the extent of her failure in her service to the Circle, to him, and to the people of Lore’s Haven. There the visions ended. He wiped his face and turned to see her sitting on her knees behind him. This time her appearance did shock him. Her hair was matted and tangled, hanging in her face as she blankly studied the ground at his feet. Dark circles weighed down her eyes, and her clothing was tattered and dirty. “Then you have to accept the truth too,” he said, closing his eyes. He brought back up her feelings of pride at being a Shanthi. He remembered the warmth he’d seen between her and Reyga. He thought about her warrior spirit during the battle with the Trellin, and then later, the fierce determination she showed in the healing area. He remembered her playing with the children at Lore’s Haven, and finally her willingness to sacrifice herself to defend him. All of these feelings and images he took and, with the guidance of the other presence, he impressed them onto her. Overriding her self-condemnation, he forced her to see herself how others did, as the proud, honorable Shanthi warrior they had come to respect, and in some cases, to love. He opened his eyes and saw her as she had first appeared to him, strong and proud. She was looking down at herself as the last shadows of the tattered clothes faded away. She looked up at him, her eyes wide. “How did you do this?” she whispered. “But…I failed in my duties,” she said, but there was a note of uncertainty in her voice. Her eyes never leaving his, she reached up and took his hand, slowly standing to her feet. He didn’t know how to answer. The fact that she’d called him ‘Jason’ hadn’t escaped him. “I’m glad I could help,” he managed. Without warning, they were back in Lenai’s quarters, sitting on the floor. The sudden change disoriented him for a moment, then the world righted itself. Lenai released his hand and undid the cloth tying their arms together. He was almost afraid to see what kind of damage her dagger had done, but when he carefully wiped away the blood, all that showed was a hairline scar across his forearm. Wow. He lightly traced the scar with one finger. “That was a little rough,” he said as they stood up. He nodded, and the two of them went to go find Reyga. 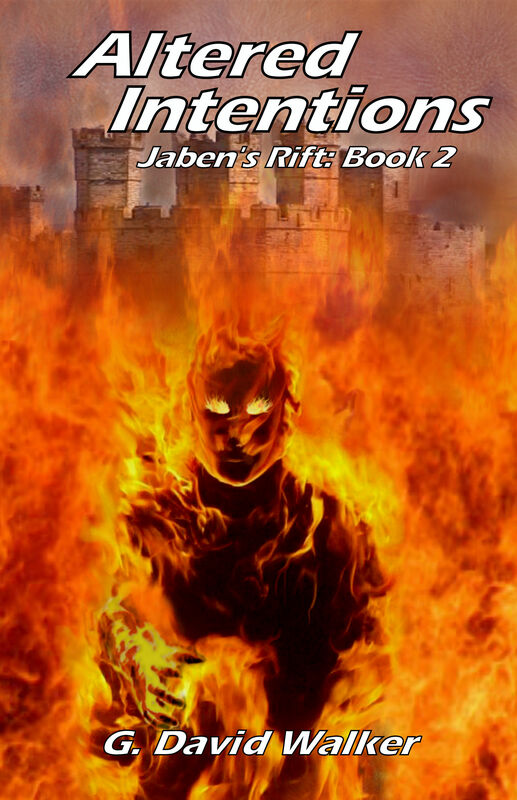 Posted on May 24, 2017 May 28, 2017 by Dave WalkerPosted in Jaben's RiftTagged Fantasy, Jaben's Rift. Previous Previous post: Batter Up!